In the Heritage Gardens, there’s a range of garden collections that reflect the unique cultures that make up diverse Singapore, along with the city-state’s colonial heritage (It was a British base for many years). 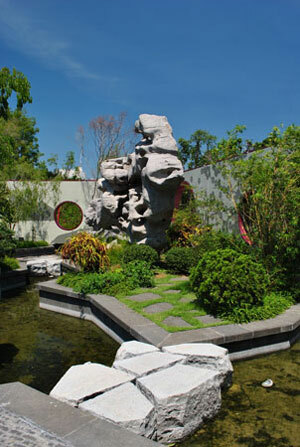 A new Malay Garden “tells the story of life in a traditional ‘kampong’ (village),” while the Indian Garden’s layout “echoes a traditional illustrated flower motif.” The Chinese Garden illustrates the role of gardens as places of “inspiration for writers, poets, and artists” — places of tranquility — in Chinese culture. The Colonial Garden tells the story of plants as “Engines of Empire,” featuring the many spices and other crops that served as a foundation for regional, British-controlled trade. 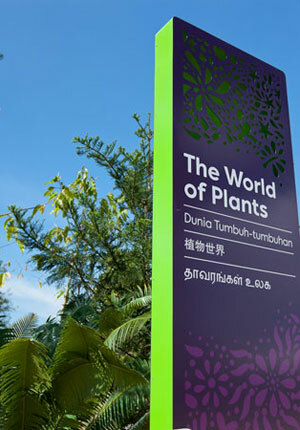 The “World of Plants” Garden then showcases the rich plant biodiversity of Southeast Asia. There are gardens dedicated to ancient plants, fruits and flowers, trees, tropical palms, and the understory, which looks at the “forest root zone,” the plant species that make up the forest floor. 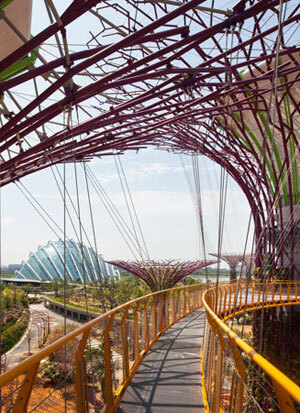 Working together with the outdoor gardens and supertrees are “cooled conservatories” that use “sustainable energy sources” (from the supertrees) to create new micro-climates indoors. “The Flower Dome replicates the cool-dry climate of Mediterranean and semi-arid sub-tropical regions such as South Africa and parts of Europe like Spain and Italy. 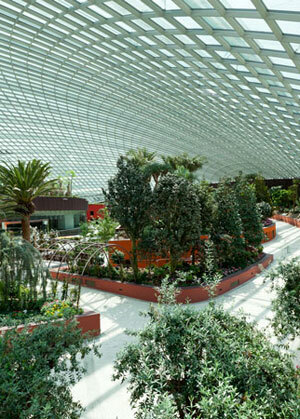 The Cloud Forest Dome replicates the cool-moist climate found in tropical montane regions between 1,000 to 3,500 metres above sea level, such as Mt Kinabalu in Sabah, Malaysia, and high elevation areas in South America.” The Cloud Forest alone has some 130,000 plants. 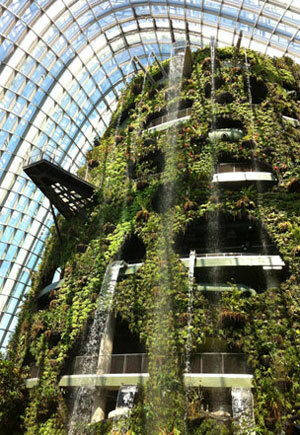 Sounds like a lot of energy and air conditioning for those cooled conservatories. But Grant Associates argues that the “suite of technologies used” actually means about 30 percent energy savings on a conventional (if there is one?) climate-controlled conservatory. The design team used “spectrally selective glass and light sensor-operated shadings” to reduce solar heat gain and maximize sun exposure for the plants. There are more complex systems like “thermal stratification, an efficient de-humidification cooling process, and a Combined Heat Power (CHP) biomass steam turbine” to control the indoor climate and create electricity. As a final note, the signage by Thomas Mathews graphic design is really fun. 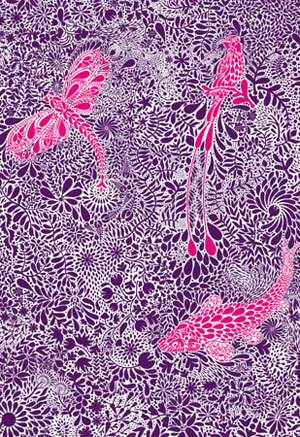 The design team used the colors of the local Mangosteen fruit as the palette, with a dark purple as the unifying color. 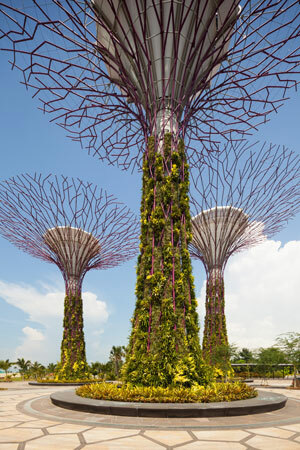 We would have liked to hear more from Grant Associates about how they will harvest Singapore’s heavy rainfall to water the garden year round. Will there be cisterns to store some of that water for drier periods? Also, there is little info about the biodiversity benefits they are expecting, beyond the plants. 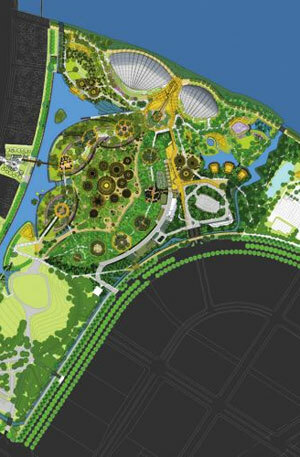 What kind of insects and birds can be supported by the new park? Still, the gardens are expected to be a huge tourist draw. The Wall Street Journal writes that tickets will be $28 Singapore dolllars for tourists and $20 for locals. Restaurants, bands, bars will also help draw people in late into the night.